Henry McCollum and Leon Brown pardoned after DNA exoneration and 30 years in prison. North Carolina Gov. Pat McCrory in February in Washington, D.C.
North Carolina Gov. Pat McCrory granted pardons of innocence Thursday to Henry McCollum and Leon Brown, two mentally disabled half-brothers exonerated last September of a 1983 murder for which they have served three decades in prison. Superior Court Judge Douglas Sasser last fall ordered the men to be released from death row after DNA evidence implicated another man, and after it became clear that the two had falsely confessed during highly coercive police questioning. As noted in our coverage at the time, the state also declined to test evidence that could have cleared the suspects, and it wasn’t until 2010, when the North Carolina Innocence Inquiry Commission got involved in the case, that the potentially exculpatory evidence was re-examined seriously. At the time of his release, McCollum was North Carolina’s longest-serving inmate on death row. 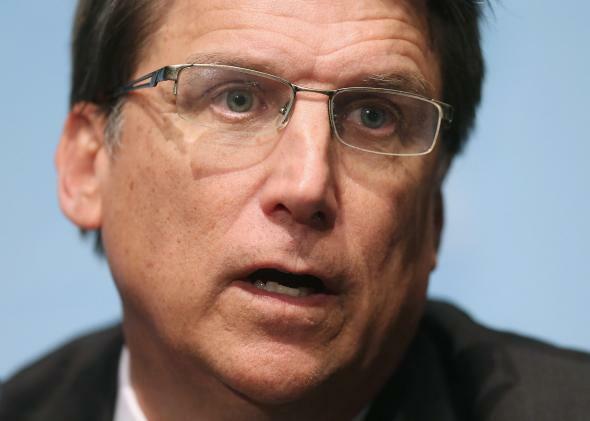 McCrory took more than nine months to decide to grant the pardons while the two men remained in limbo. The pardons now make each of the two men eligible to receive $750,000 in compensation from the state. In the coming weeks the Supreme Court will decide whether one of the drugs used in state lethal injection protocols is truly cruel and unusual for purposes of the Eighth Amendment. The machinery of death presses on.